FOR SOME, 2003 seems like the recent past. In 2003, the United States began the Iraq War and the Merriam-Webster Dictionary Online declared “democracy” to be the #1 Word of the Year. In 2003, The Lord of the Rings: Return of the King was released to rave reviews from critics, audiences, and (eventually) the Academy of Motion Picture Arts and Sciences. In 2003, Ballet San Jose performed a wide variety of pieces, from The Tempest to Appalachian Spring. Yes, 2003 was a banner year. But it was eight whole years ago, and some things that were important and relevant then may not hold as much weight now, as we near the end of 2011. Some things, however, persist over time – specifically, Dennis Nahat’s The Nutcracker, which Ballet San Jose has performed annually for over 25 years. As we prepare for another Nutcracker opening this Saturday, Dec. 10, it seems important that we take a look at a piece of the show’s history within our organization. DON‘T FEEL BAD if you’ve seen The Nutcracker many times already and still don’t know the story line. By the time E.T.A. Hoffman’s popular tale made it to Russia for its ballet incarnation in 1892, Hoffman would barely have recognized it himself. 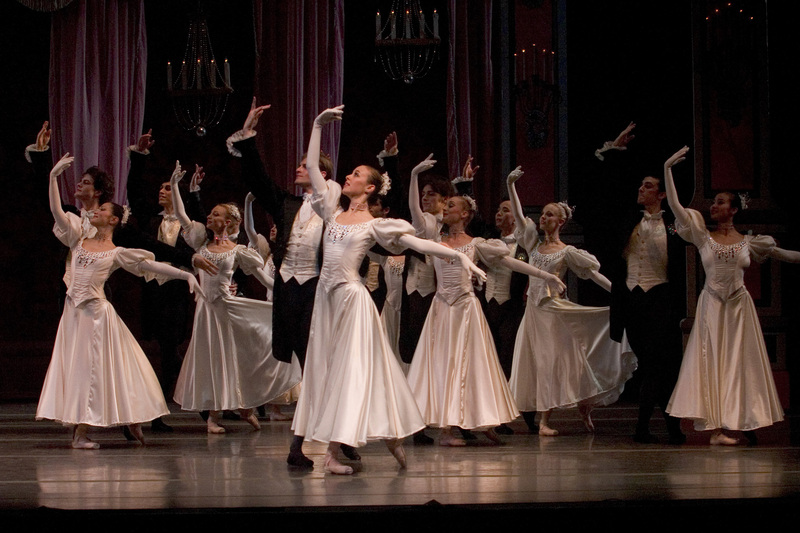 Moreover, few of the story elements have remained consistent throughout the ballet’s century-plus of productions. For Ballet San Jose Silicon Valley’s Nutcracker, artistic director Dennis Nahat has dispensed with the candy coating (the Sugar Plum Fairy and the idea of representing countries as consumables) and brought back international potentates. …[remembering] the fate of the Russian nobility, decimated just a generation after they were so gaily celebrated in The Nutcracker’s waltz, and on the precarious balance between beloved tradition and hopeful change. It’s quite a remarkable read. Although the Company itself is now known as simply Ballet San Jose, many of the article’s points remain unchanged by the last eight years. Karen Gabay and Alexsandra Meijer still perform fantastically in the roles they danced in 2003. Dennis Nahat still puts a unique and emotional spin on a classic ballet tale every December. Ballet San Jose’s The Nutcracker continues to be a holiday tradition for a flourishing Silicon Valley arts community. And still, some spark of magic, some feeling of novelty, keeps the crowds coming back to BSJ’s The Nutcracker year after year after year. Some things don’t need to change completely in order to seem new again, and Marianne Messina’s 2003 article is proof of that very fact. PLEASE NOTE: The opening matinee on Dec. 10 at 1:30 PM is ALMOST SOLD OUT. There are still a few seats left in the balcony, but the floor is completely filled. Additionally, there is currently no GoldStar.com ticket deal for this year’s Nutcracker. Karen Gabay and Raymond Rodriguez in Ballet San Jose's 'Giselle' (2004). Photo by Robert Shomler. Last Thursday, Dave Wilson (better known as the guy behind the blog “Dave Tries Ballet“) asked the twitterverse at large a ballet question we found most interesting: What are the four big danseur noble roles? Fascinating, we thought. A brilliant question, we said. But since we are simply BSJ staff, we thought it best to go to the real experts. We asked Ballet San Jose’s Artistic Director Dennis Nahat and Régisseur Raymond Rodriguez for their input. The roles I think are most desirable by the male danseur nobles! There you have it, ballet fans, from the keyboards of the experts behind Ballet San Jose in California. We hope these lists have given you further insight into our world, and we think you may find some surprises there as well. What do you think? Do you agree with Raymond and Dennis? How would you change the lists above? Feel free to throw fun questions our way and we’ll try to get some interesting answers for you in the future! The company performs the Grand Ball in Ballet San Jose's 'The Nutcracker.' Photo by Robert Shomler. I love our Nutcracker ballet because of its wonderful scenario. It has such a strong second act. In most traditional versions of this story, Maria (or Clara as she is often called) spends all of Act II sitting on a pile of pillows and watching the dances from the Land of the Sweets. Not so in Dennis Nahat’s version of The Nutcracker. Once Maria has rescued the enchanted Nutcracker Prince from the evil Mouse King, she climbs upon a giant white Snowbird and flies off with Prince Alexis on a world tour. They visit Spain, and Arabia and China…and at each stop they sample the food and drink of the country and learn the local dances. The are not “watchers”…they are “doers”! Once they reach the Prince’s home in Muscovy, Maria meets his parents, the Tsar and Tsarina, and she attends a marvelous Grand Ball held in her honor. By this time, the character of Maria is completely transformed. At each stop, Maria’s experiences have changed her. She starts the ballet as a little girl playing with dolls, but by the end of her journey, she is a young woman. She will never be the same. It really is a show to see. Dennis Nahat is a great storyteller! Karen Gabay dances the part of Maria in Ballet San Jose's 'The Nutcracker.' Photo by John Gerbetz. Attention, Ballet San Jose fans! It’s been almost a year since we started this blog, and you might say that we let it fall temporarily by the wayside. With all of the activity around Ballet SJ, we have been known to throw ourselves completely into our work and brush aside the extraneous (but no less important!) details. Luckily, we have some new faces around the Ballet this season. And our new Social Media Coordinator is fully committed to getting this blog up and running in time for The Nutcracker this December. It certainly has been a whirlwind year — after 2010’s Giselle (Oct. 22-24) and The Nutcracker, (Dec. 11-26), Dennis Nahat and Ballet SJ wowed audiences and critics with two favorites: Swan Lake (Feb. 25 – 27) and Carmen (Apr. 1-3). Both shows were spectacular. We were lucky enough to have ballet superstar Carlos Acosta as a guest star in Swan Lake — by now one of the most notorious ballets of our time, thanks to the Oscar-nominated movie Black Swan. Because of the hard work and sanity of our dancers and staff, we avoided the hallucinations and nervous breakdowns that Hollywood associates with the show. Carlos and Ballet SJ were received with critical applause, and the show was a rousing success. Later this past spring, our dancers seduced large crowds with a tale of intrigue and passion from the late French Dance Master Roland Petit. Carmen was a saucy affair that the San Francisco Chronicle called an “opulent and rambunctious, daring production.” And as Carmen ended, so did the 2010-2011 season. Where are we now? Ballet SJ is gearing up again for a 2011 run of The Nutcracker. For us, the holiday season always comes with a certain sense of familiarity, of coming home. Dennis Nahat’s Nutcracker remains a unique and colorful retelling, and it is entirely ours. Keep an eye out for future blog posts from Ballet SJ. We have an exciting host of things planned — interviews with our dancers, exclusive photos from around the Ballet, and other long-winded ruminations from your favorite Social Media Coordinator. Please feel free to subscribe to this WordPress blog, or follow our real-time updates on Twitter and Facebook. For now, any ballet fan, aspiring dancer, or San Jose local who strolls down North First Street this fall will see us right where we have always been — a pale pink building tucked up against a gorgeous mural; a restless and athletic crowd of dancers milling outside the school; a box office window filled with posters from seasons past. If you’re ever in the area, please stop by. We’d love to see you.